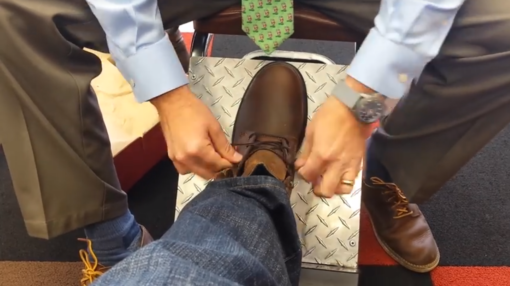 If you want maximum comfort from your boot, getting the right fit for your work boots (or any boots/shoes for that matter) is an absolutely essential first step. If you’re like most folks, you were sized and fitted for shoes at some point in your life, but most likely that was many years prior to today. Just like your waistline, your feet can actually change over time. Our point? You should never assume you know exactly the right size in any footwear! Everyone’s feet are different. Most brand’s sizing is different. Furthermore, some shoes within the same brand might have a different fit! With so much variation, it’s crucial that you get properly fitted by a professional for each and every pair of boots you buy. When it comes to proper-fitting footwear, there is no such thing as one size fits all! We’ll measure your feet for FREE! By that, we mean your foot length, width, pressure points, and arch type for each foot (since it’s fairly common for one foot to be larger/wider than the other). Our foot scanning technology tells us everything we need to know, but if you’re old-school, no worries. We still keep old faithful, the Brannock device on hand and ready! How long are you on your feet during your work day? What pains do you experience in your feet and body? What boots do you currently own? How do you wear out other boots? All of these details add up , and can be the difference between a boot that fits, and a boot that doesn’t… even within the same shoe size. With all the crucial data gathered, we’ll make a few recommendations and let you try each one of them on… no rush, no fuss, no pressure. Walk around the store as much as you like. If it’s not perfect, it’s not right… and we’re all about doing things the right way. Perfect means no blisters, no foot aches, no sore arches. We take the time to make sure our footwear keeps you at the top of your game. Our legendary boots are known for comfort, durability, longevity and protection. In order to get these out of your Red Wings, you must be wearing the right size…which can only truly come from a custom (FREE) fitting in store! Visit Your Closest Red Wing Richmond Store For A FREE Custom Fitting! Whatever you do, don’t settle for anything less than the exact fit you need. Every day, we run into new customers that are”making-do” with boots that don’t fit right. Why wouldn’t you be 100% sure? When you invest in your feet, invest wisely. 2: This process is entirely FREE! 3: We offer a 30 Day Comfort Guarantee. If you don’t love your new Red Wings, we’ll exchange or refund your purchase within the first 30 days…no questions asked. Now all you have to do is visit a Red Wing Richmond location in Midlothian, Chester, or Brook Road. Every one of our footwear professionals is equipped with the knowledge and experience to get you your fit… so we’ll see you soon! Sure, you can find us online or on Facebook. But really… you need to stop by our store to experience the benefits of a true custom fitting.